In the car scene of today, the current trend seems to be pushing cars to their absolute extreme, often leaving any sense of practicality behind in the pursuit of creating the next "big hit." The wheels sit mere millimeters (or less) from the fenders, smashing into them over even the slightest of bumps, while the ground "clearance" insures the body of the car is just as friendly with the pavement. The car becomes more of a chore to drive than enjoyable, and while the cars look fantastic doing this, it makes them less than desirable to drive on a daily basis. Often the so called "pride and joy" of the owner sits waiting for the next event that is justified as "worthwhile" to limp the car to, or even worse, trailer the car to. Respectable in its own right for pursuing the edge, this brings the “daily driver” into play to be able to get from A to B during the week, an often bland car used to fulfill the standard needs of a vehicle that your Mother can understand. Ralph Ruiz has found the perfect middle ground and created an absolutely stunning vehicle that maintains the role of daily driver, while still looking fantastic. Ralph picked up his 1992 525i nearly 4 years ago, right around when I first met him through our local BMW community. Although he came across a bit intimidating at first, he has shown himself to be one of the most genuine guys I have came across in the car scene, and it is always a pleasure to sit and chat with him given the chance. 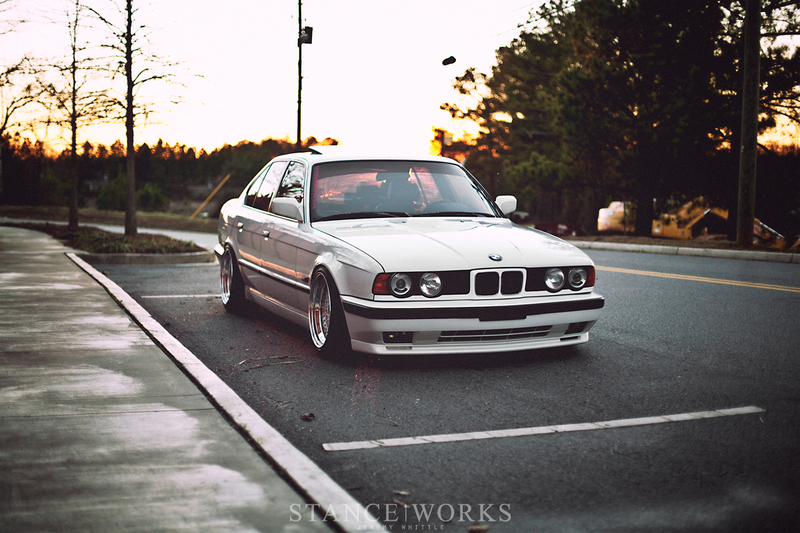 His e34 came into his ownership as a clean, relatively stock car to be used as a daily driver. Despite this however, Ralph, being a car enthusiast, wasted no time digging into it. Shortly after picking the car up, an absolutely gorgeous set of 17x9”and 17x10” AC Schnitzer Type 1 Rennsports were acquired and mounted to the vehicle, fitted aggressively and the car was given a healthy drop via custom Nex coilovers. The wheels complimented the car perfectly; leaving little room for improvement, they were arguably one of the best choices for his car. It established Ralph as someone to watch out for and absolutely caught my attention; it created a splash as it made its rounds locally and on the forums. The car had an effortless look to it that really caught your attention without being in your face, and was very tastefully styled. From there the car underwent quite a few changes, one of the most notable being the heart of a 1997 M3 installed by the guys at German Car Repair. 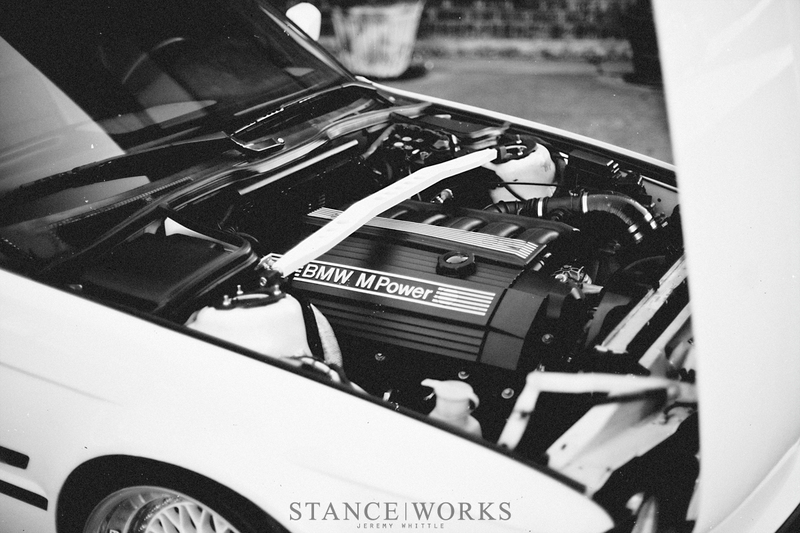 The S52 was swapped into the car, converted to OBD1 in the process, and provided a significant improvement in power over the factory M50. The difference between the two? A respectable 60 horsepower from one inline-six to the other. Not one to be satisfied easily, Ralph bolted up a set of headers , M50 Manifold, UUC M5 Clutch and Lightweight flywheel, bigger injectors, a tune, and a custom exhaust courtesy of Alan at Extreme Performance Mufflers. 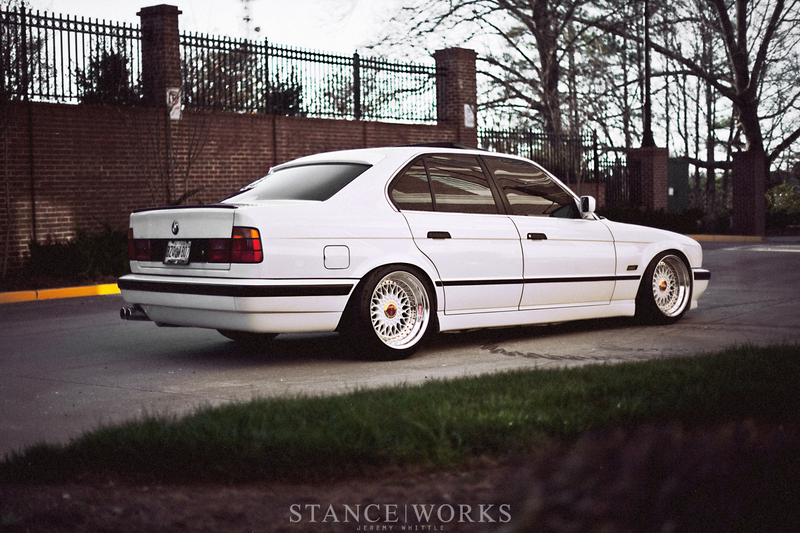 The exterior of the car received the "M5 treatment" via a Euro M5 front bumper, side skirts, trim and rear license plate filler, and was topped off by a Reiger rear window spoiler. In addition to the custom coilover setup, the brakes were upgraded on all 4 corners, a strut bar was added, as well as camber plates, to keep the car planted and nimble. The interior had an AC Schnitzer Steering wheel and UUC Shift Knob and E-Brake handle installed, as well as a custom two-tone tan and black conversion done with a full interior removal including the dashboard and carpet. The photos Ralph showed me of this were enough to send shivers up the spine of any car enthusiast; not a fun job in the slightest. An e38 Rear Storage compartment conversion in addition to a speaker and subwoofer upgrade rounded out the interior upgrades, keeping the car audio sounding great for the many miles per week spent inside. The car now drove and handled just as good as it looked, and despite all of the upgrades, kept a very clean, natural look and feel to the car. It was, by any definition, a solid car, with almost all areas being covered, more than enough for most, but Ralph isn’t most people. All of these upgrades, and countless others, were done over a two-year period, with the AC Schnitzers poised as the focal point of the car's aesthetics. In a questionable, but in the end successful decision, the centers were powder coated white a year and some change after being mounted, which quickly became the car's signature look. A set of Penta wheels, and a set of M-System Throwing Stars also followed through with the signature white center treatment that Ralph had been running with, but nothing “fit” quite like the AC Schnitzers. One of the easiest ways to make a big change to the appearance and attitude of a car is to switch out the wheels, and naturally Ralph got the urge to change it up, but was a little unsure of exactly what to do in order to top the ACSs. A friend of his, Paul, who has quite the collection of wheels and has built a few very notable sets in our community, insisted if he sold the ACS and let him put together something for Ralphs car, he would be able to produce a set that would make him forget all about the ACSs. Deciding exactly what route to go to maintain the cars simple looks, as well as its drivability, led to the decision of a set of very wide custom BBS, and the final specs were determined after quite a few phone calls back and forth and long nights in the garage with a ruler. The results were 17x9.5 et0 and 17x10.5 et0 wrapped in 225/45/17s and 255/40/17s respectively. The Prima Donna finish was decided upon to keep with Ralph's preferred and almost signature white-on-white look, with a bit of pop added from the Red BBS caps set in quarter height gold plated hex caps. 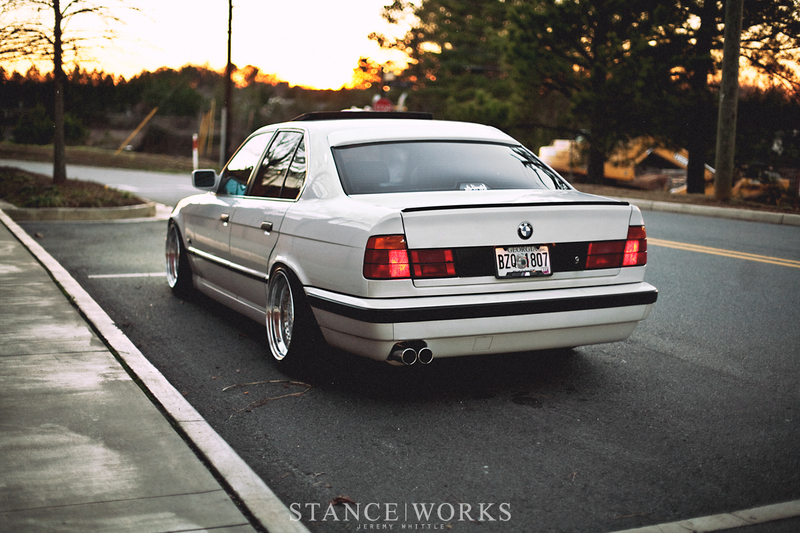 The end result, as you can see here, is nothing short of gorgeous; the fit is on-point and they compliment the lines of the E34 perfectly. The car looks phenomenal in photos, and is near impossible to turn your head away from in person. Ralph has certainly outdone himself with the current wheels, and the car has taken another step forward, difficult to do considering how clean it already was prior. 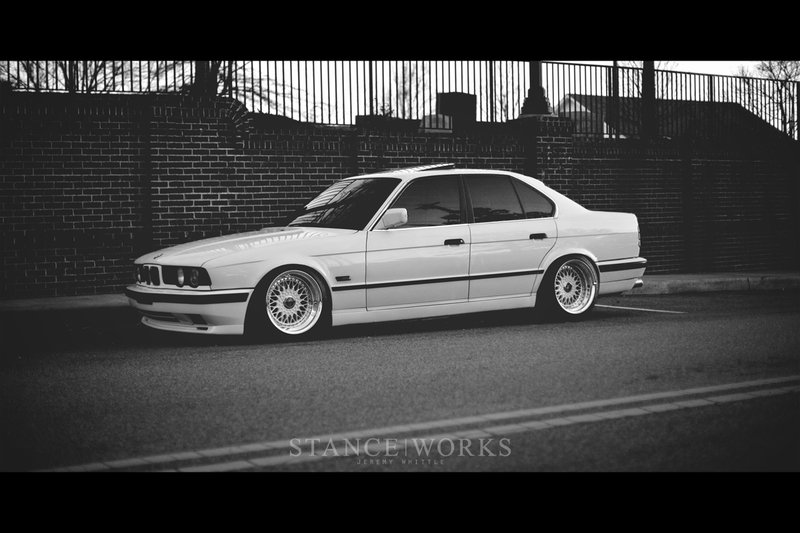 His goal with the car in his own words was “...to have a "stanced" car that could handle my aggressive style of driving, but would not lose too much of its original appeal or ride. I have always appreciated certain elements from both stock and modified cars, and I would I like to think that I have reached a happy place right in the middle.” I do not think I would be alone in agreeing with him: he has indeed found the happy medium. The best part of the whole package is that his pride and joy is enjoyed every day, whether it be running downtown for business, the grocery store, or to a local meet. His blood sweat and tears are rewarded every time he leaves the house, being able to enjoy the machine he created constantly. The car, although low, and the fitment close, is still an absolute blast to drive, and drive it, Ralph does. The build has been a constant evolution spanning over 3 years, with many more to go. 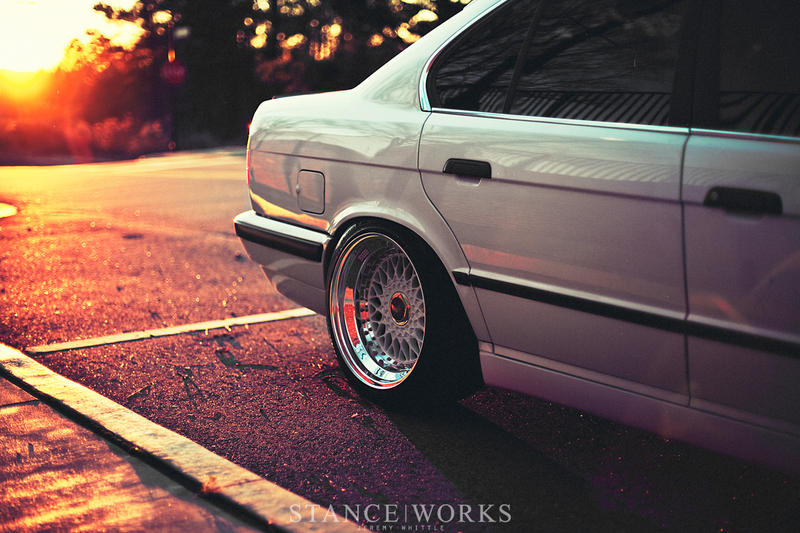 After spending that long with a car, you start to develop a bond with it beyond simply man and machine. As many of us can relate to, Ralph has a special bond with the car, in a way beyond simply being his means of transportation. It isn’t just a car anymore, it is an extension of himself. Builds like this don’t happen overnight, and it is often easy to lose sight and abandon a project before reaching a point where you can start to call the car "complete." Ralph has pushed through hardships with the car, back to back blown head gaskets being a particularly frustrating example, but kept his head up through it all, and the dedication has paid off. There is something special about a car like this being put to use for the daily grind; about enjoying your hard work day to day rather than the odd weekend. I am excited to see where he goes from here, and for now I enjoy seeing the car whenever we cross paths around town, and I just can’t help but to be left with a big old grin across my face as he goes ripping by and we exchange waves. I’m going to do all of this to my car some day. Everything he has done is what I wanted to do down the the windscreen. You want to buy it ? Why is it for sale again. What transmission did Ralph use?